This empirical study examines substitute/complementary relationships in the demands for ICT capital, non-ICT capital, energy, materials, and labor in the industrial sectors in Japan and South Korea during 1973–2006 and 1980–2009, respectively. In doing so, a dynamic factor demand model is applied to link intertemporal production decisions by explicitly recognizing that the level of certain factors of production (referred to as quasi-fixed factors: ICT and non-ICT capital) cannot be changed without incurring so-called adjustment costs, defined in terms of forgone output from current production. Special emphasis is on the effects of ICT investment on energy use through the substitute/complementary relationships. This study quantifies how ICT capital investment in South Korea and Japan affects industrial energy demand. We find that ICT and non-ICT capital investment serve as substitutes for the inputs of labor and energy use. The results also demonstrate significant cost differences across industries in both countries. The capital stock is taken from the Korea Industrial Productivity Database for Korea, and from EU KLEMS for Japan. Atkinson, R. D., & McKay, A. (2007). Digital prosperity. Understanding the economic benefits of the information technology revolution. http://www.itif.org/files/digital_prosperity.pdf. Accessed 20 Oct 2013. Bhattacharyya, S. C., & Timilsina, G. R. (2009). Energy demand models for policy formulation: a comparative study of energy demand models (policy research working paper WPS4866). World Bank. http://econ.worldbank.org/external/default/main?pagePK=64165259&theSitePK=469372&piPK=64165421&menuPK=64166093&entityID=000158349_20090317093816. Accessed 12 Apr 2013. EIA (2011). International energy outlook. U.S. energy information administration. US Energy Information Administration. http://www.eia.gov/forecasts/ieo/pdf/0484(2011).pdf. Accessed 8 Sep 2013. Fukao, K., Miyagawa, T., & Pyo, H. K. (2009b). Estimates of multifactor productivity, ICT contributions and resource reallocation effects in Japan and Korea (RIETI Working Paper 09-E-021). The Research Institute of Economy, Trade and Industry. http://www.rieti.go.jp/jp/publications/dp/09e021.pdf. Accessed 12 May 2013. GeSI SMARTer 2020 (2012). Smarter 2020: the role of ICT in driving a sustainable future. Global e-Sustainability Initiative. http://gesi.org/SMARTer2020. Accessed 20 Oct 2013. Groth, C. (2005). Estimating UK capital adjustment costs (working paper 258). Bank of England. http://www.bankofengland.co.uk/publications/Documents/workingpapers/wp258.pdf. Accessed 21 Apr 2013. IEA (2011). Climate & electricity annual: data and analysis. International Energy Agency. http://www.iea.org/publications/freepublications/. Accessed 20 Jun 2013. Kanamori, T., & Motohashi, K. (2007). Information technology and economic growth: comparison between Japan and Korea. Research Institute of Economy, Trade and Industry (RIETI). http://ideas.repec.org/p/eti/dpaper/07009.html. Accessed 13 May 2013. Khayyat, N. T., & Heshmati, A. (2014). 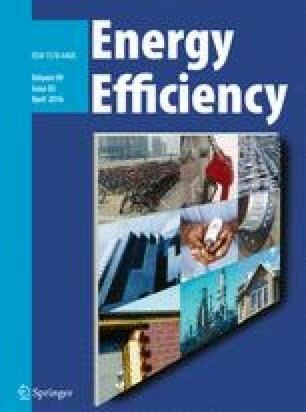 Production risk, energy use efficiency and productivity of Korean industries. https://static.sys.kth.se/itm/wp/cesis/cesiswp359.pdf. Accessed 12 May 2014. Koschel, H. (2000). Substitution elasticities between capital, labour, material, electricity and fossil fuels in German producing and service sectors (discussion papers 00–31). http://www.zew.de/en/publikationen/publikation.php3?action=detail&nr=435 Accessed 12 May 2013. Mun, S. B. (2002). Computer adjustment costs: is quality improvement important? http://homepages.nyu.edu/~sbm210/research/itjq.pdf. Mun, S. B., & Nadiri, M. I. (2002). Information technology externalities: empirical evidence from 42 US industries (NBER Working Paper w9272). National Bureau of Economic Research Working Paper Series. http://www.nber.org/papers/w9272. Accessed 23 Mar 2012. Nadiri, M. I., & Prucha, I. R. (1999). Dynamic factor demand models and productivity analysis (NBER working paper 7079). National Bureau of Economic Research Working Paper Series. http://www.nber.org/papers/w7079.pdf. Accessed 23 Mar 2012. Oliner, S. D., & Sichel, D. E. (2000). The resurgence of growth in the late 1990s: is information technology the story? (Working paper 2000–20). FEDS Working Paper. http://papers.ssrn.com/sol3/papers.cfm?abstract_id=233139. Accessed 14 Jul 2013. Pilat, D., & Lee, F. C. (2001). Productivity growth in ICT-producing and ICT-using industries: A source of growth differentials in the OECD? (OECD working papers 2001/04). OECD Science, Technology and Industry. http://dx.doi.org/ 10.1787/774576300121. Accessed 3 Jan 2014. Schulte, P., Welsch, H., & Rexhäuser, S. (2014). ICT and the demand for energy: evidence from OECD countries. Environmental and Resource Economics, 1–28, doi: 10.1007/s10640-014-9844-2. Seungdo, K., Hyeon-Kyeong, K., & Hyoung-Jun, K. Climate change and ICTs. In Telecommunications Energy Conference, 2009. INTELEC 2009. 31st International, October 2009 (pp. 1–4). doi: 10.1109/INTLEC.2009.5351786.